A night of eternal terror. A world ruled by fear and horror. Vampires who rule the nignt. Shapeshifters who prowl the forests. Eldritch ghouls and undead skeletons who prey upon a fearful popuilace. if ever a world needed heroes, it is the world of Ravenloft. 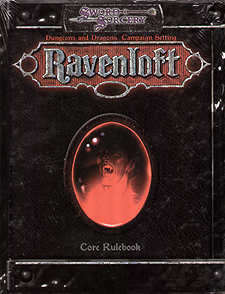 THe RAvenloft setting takes one of the classic roleplaying game worlds and brings it up to date for the third Edition using the d20 rules system. Players assume the roles of brave adventurers facing ultimate evil in hopes of saving the world, all in a Gothic setting of high adventure.